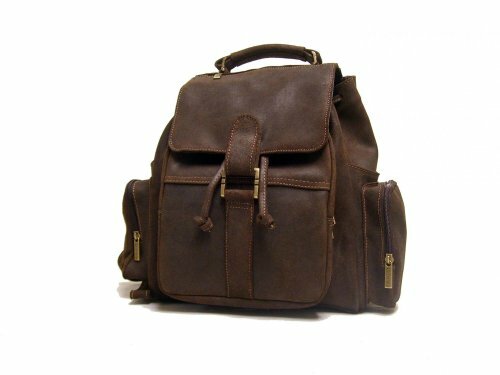 This LeDonne distressed leather backpack has classic styling in a contemporary design. The old school look of the distressed leather gives this leather bag a vintage feel but with all the pockets you have plenty of room for all your modern gadgets. To top it all the leather just keeps getting better with time. Features: Premium full grain distressed leather handcrafted convenient magnetic loop closure large main compartment interior zipper pocket draw string top closure front zip pocket with leather organizer that holds pens and business cards two side zipper pockets two side quick access slip pockets front flap pocket convenient heavy duty top handle padded adjustable strap size: 15" x 14" x 7", weight: 3 lbs. Padded adjustable strap, size: 15" x 14" x 7"
If you have any questions about this product by LeDonne, contact us by completing and submitting the form below. If you are looking for a specif part number, please include it with your message.